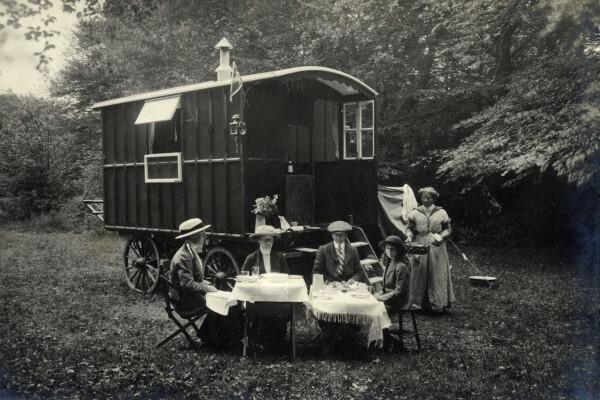 From 30 May to 8 June 1914, the then Caravan Club ran the biggest gathering of its members and their caravans held since the organisation was formed in 1907. 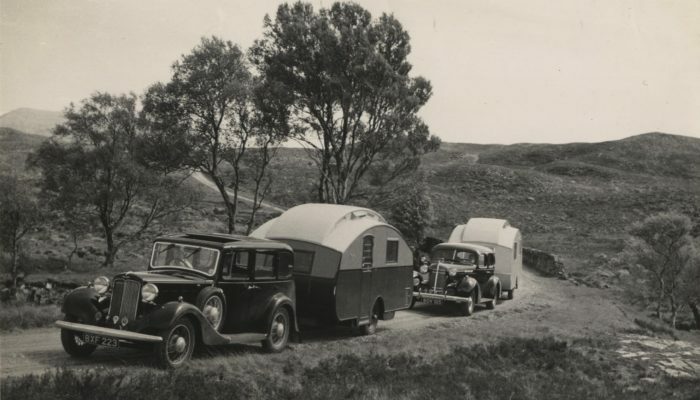 The Meet, a forerunner to the caravan Rally, showcased the growing popularity of horse-drawn caravanning in the UK. Yet only two months later the world was plunged into the devastating conflict of the First World War. Never again did so many horse-drawn caravanners gather in the same place at one time. This page features a range of images and articles relating to the event, including idyllic photographs rediscovered by the Club in 2008. Following a programme of cataloguing, digitisation and extensive research, the story of the Meet has been brought back to life. 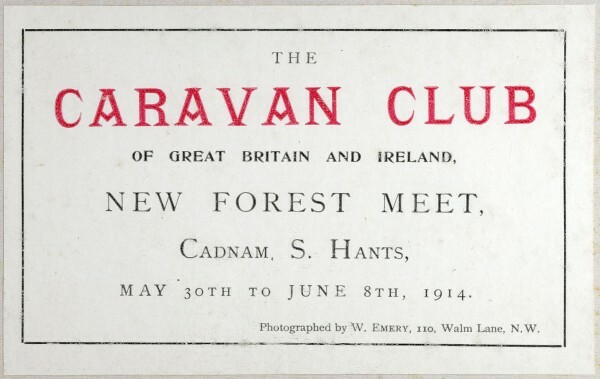 Label from the front of a photograph album featuring images of The Caravan Club’s 1914 New Forest Meet. 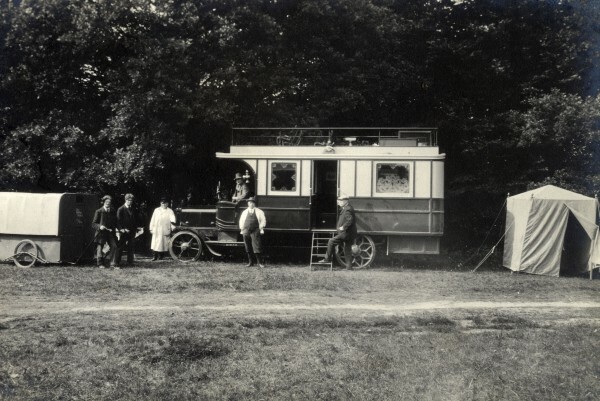 A 1913 Daimler chassis motor caravan owned by Caravan Club member Mr Albert Fletcher (1858 – 1925). Fletcher was a wealthy Mill Owner of Ashton-under-Lyne, Lancashire, and a pioneer of motor caravanning. This was Fletcher’s second motor ʼvan which weighed 5 tons and travelled at 12mph/19.31kph. 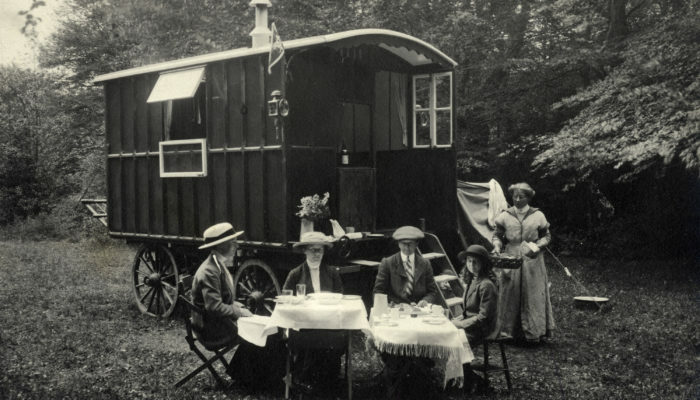 Many traditional horse-drawn caravanners disliked such motor caravans, seeing them as too fast and noisy. 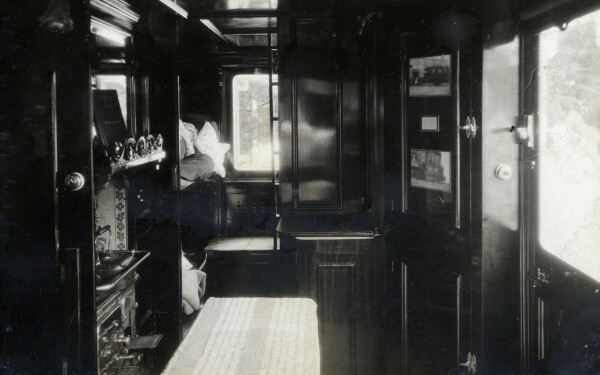 Interior of Mr Albert Fletcher’s (1858 – 1925) luxurious 1913 motor caravan. The body was built by Burton-on-Trent based Orton & Sons and mounted on a 10hp Daimler Chassis. Sleeping compartments were placed at the rear, nearby to a ladder which led to the upstairs deck through a hatch. Miss Grace Simmons and her party are served by the maid who joined them at the Meet. Miss Simmons from Oxfordshire, later became a member of The Caravan Club’s Committee. She was a modern and independent lady who caravanned around the country with friends enjoying fishing, shooting and hunting. 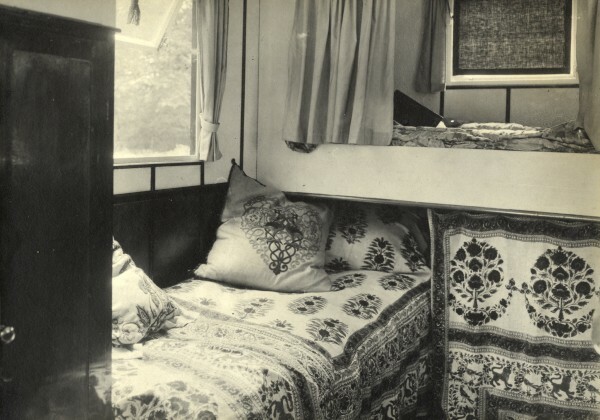 Interior of Miss Grace Simmons caravan, simple and feminine in design with fabrics inspired by the popular Arts & Crafts style of the period. 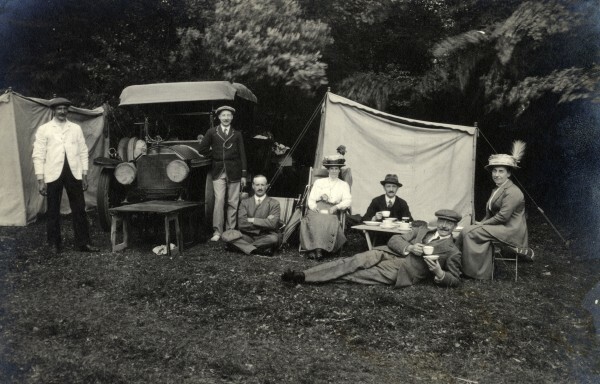 Mr Spence Thomas from Cardiff, Wales, hosts a Whit Sunday tea party beside his 45hp Mercedes motor car and tent outfit. There is no record of Spence Thomas actually owning a caravan and as such, he was a very unusual Caravan Club member. Conveniently, his status as a motor-camper enabled him to leave his tent behind and explore the local area. W.E. Winter, the local mobile grocer and baker, pays a visit to The Caravan Club Meet for members to stock up on provisions. 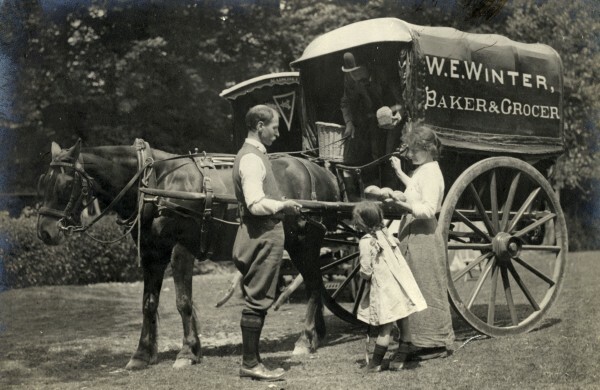 Milk was often provided to caravanners daily by the local farm. 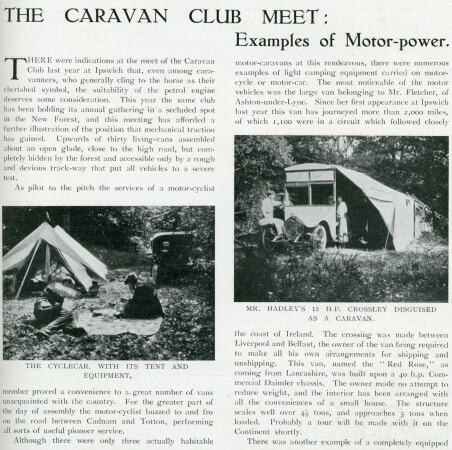 Report on motor power at The Caravan Club’s New Forest Meet taken from The Car Illustrated, 10 June 1914. 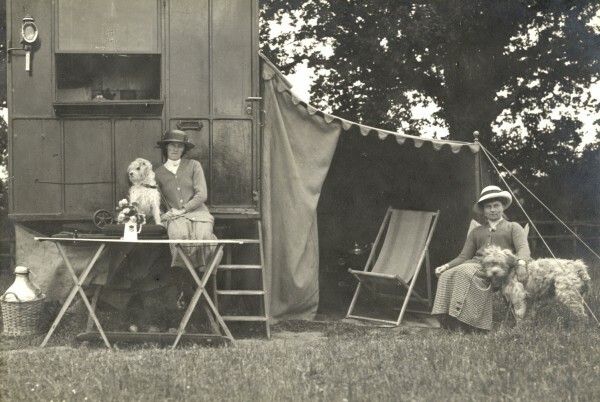 Members Miss Rayner and Miss Whitlock relax with their dogs outside the caravan named Santa. The previous year the same caravan was owned by member Mrs Towers, so it is likely this party had either recently bought the caravan or had hired specially for the Meet. 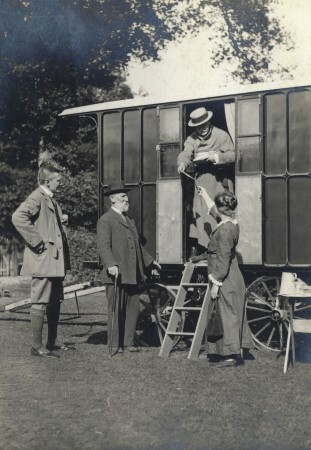 Founder and Honorary Secretary of The Caravan Club J. Harris Stone (1853 – 1939) hands out a delivery of mail from the doorway of a caravan built by Bertram Hutchings of Winchester. Mr Colin Keay, later Honorary Treasurer of The Caravan Club, is pictured to the far left. 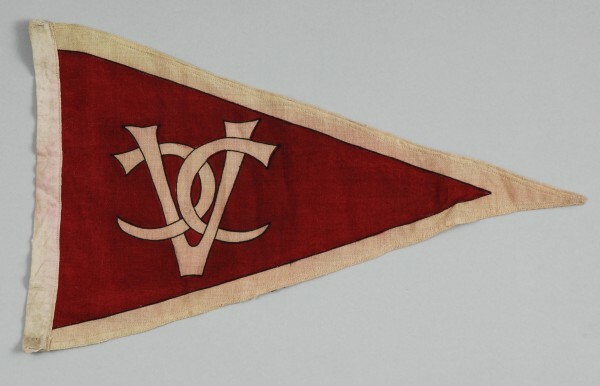 This is the first Caravan Club pennant, designed in 1908 by a Miss Whistler of Bridgwater following a competition run by the Club. Members proudly flew their pennants at the 1914 Meet. 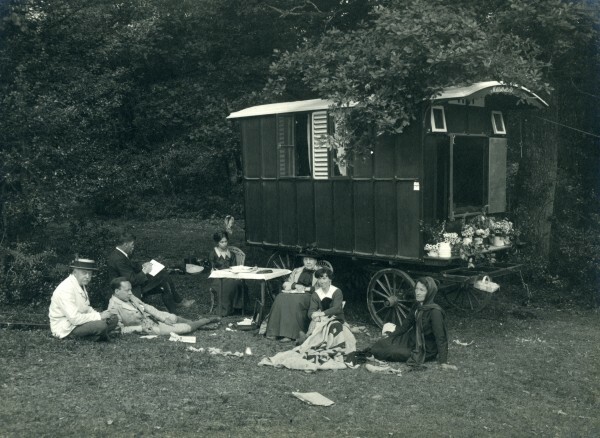 Caravan Club members relaxing in the New Forest. 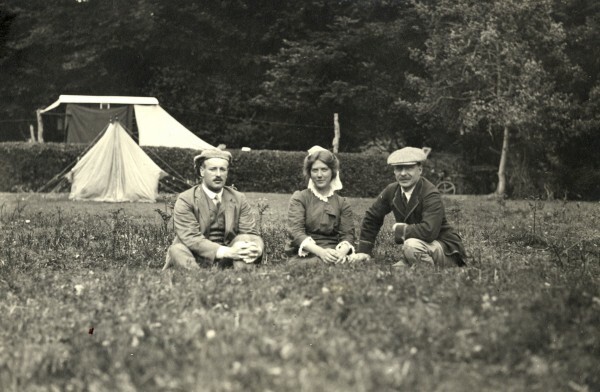 A group of Caravan Club members seated outside a caravan named Maisonette. This name was given to a model of caravan designed and built by Bertram Hutchings of Winchester. Mr and Mrs Porter of Lincolnshire journeyed to the Meet by train followed by bicycle. This was a much faster travel option than a slow-paced caravan for those short of time. 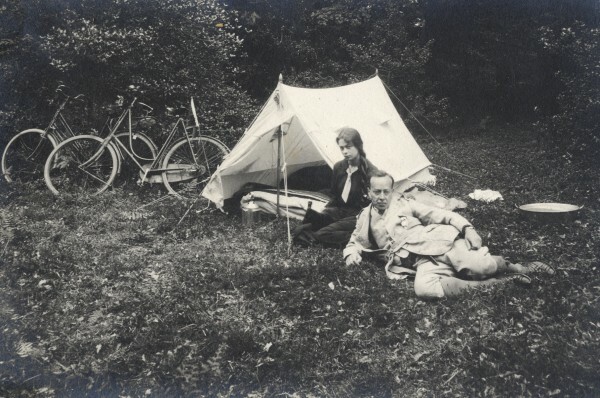 Lightweight tents, transportable by bicycle, were first invented by cyclist, canoeist and tailor Thomas Hiram Holding (1844 – 1930) in 1897. 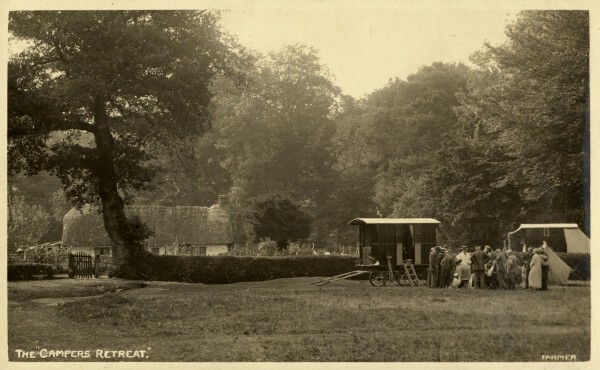 Postcard featuring a scene from The Caravan Club’s 1914 New Forest Meet. Members assemble outside a caravan.